To me, the best way to cook eggplant is to fry them. And another secret is never add in any water while cook eggplant. My mom cooks eggplant well. My sister told me how to cook eggplant in my mom’s way: fry eggplant with low heat, add in salt or soy sauce and put lid on. 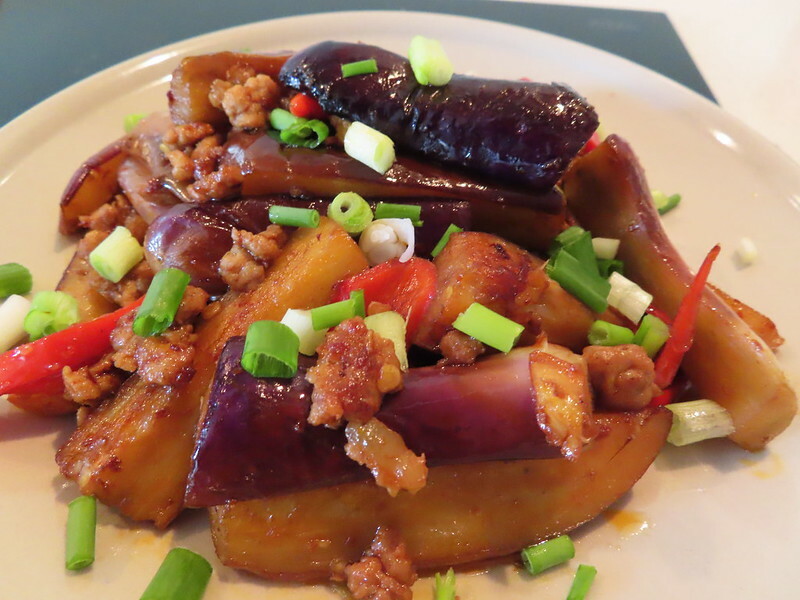 Let the low heat to evaporate water inside eggplant slowly. If water remains, eggplant will taste soggy. I likes the way how my mom deals with eggplant. And I found another way to do eggplant well, which is high height and short time while frying them. That’s how I cook eggplant in this dish. Cut eggplant into medium strips. Heat some oil in the pan. When oil is hot, Add eggplant in. Keep the medium high heat while frying. Fry them till color is bright and the skin wrinkled. Set eggplant aside for later use. Heat pan again. Add in 1 tsp oil. Add in chopped garlic and red chili. saute till aromatic. Add in minced pork. Stir fry till color turns white. Add eggplant back to the pan. Also add in 1 tsp light soy sauce, 1 tsp spicy bean paste and 1 tsp sugar. Stir fry evenly. Season with salt and garnish with chopped spring onion.